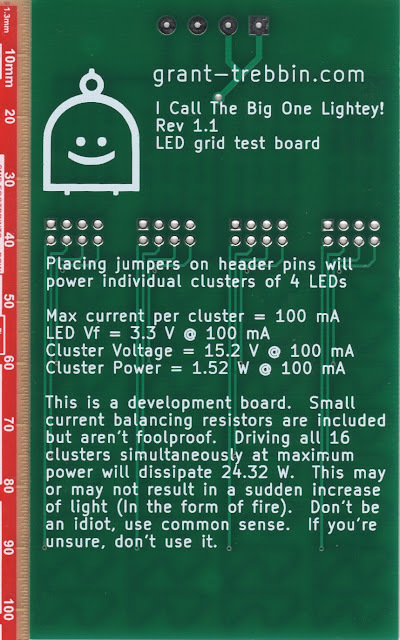 I recently did a post about a small PCB to test out some surface mount LEDs. Apart from the main objective of seeing how bright LEDs appears under certain lighting conditions, there were several other reasons for designing the board. 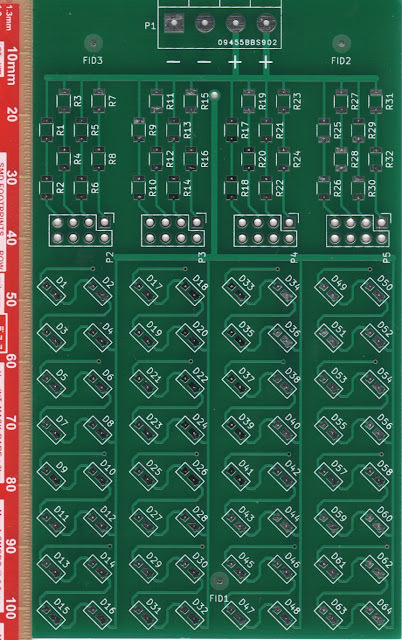 I hadn't designed a PCB in a long time and had an itch to make one, there was also curiosity about how Kicad had progressed since I'd last used it. For this board I'm also going to use a stencil for the solder paste for the first time. It never hurts to learn new skills. The other reason I wanted to do this was to test out a small volume PCB prototyping service called Breadboard Killer. It's an Australian company and I really like the name. The use of breadboards has basically become unsustainable. It seems ridiculous that I still see them in use at universities. If you're training people to design contemporary electronics that run at high frequencies and use surface mount components, starting with breadboards is a set back. Sure, give them a one to wire up a 555 timer with a blinking LED to get them started, then throw an EDA tool at them. If you know your stuff, and have faith that the schematic you design works, just go straight to PCB. They're are cheap, and if you screw up, who cares. That's why PCBs have Revision numbers and Kynar wire was invented. So how did the boards turn out? Really well. For $56 Australian I got 5 copies of a board that's 10.5cm x 6cm. The boards have nice clean routed edges and don't have rough bits where break away tabs are left behind. 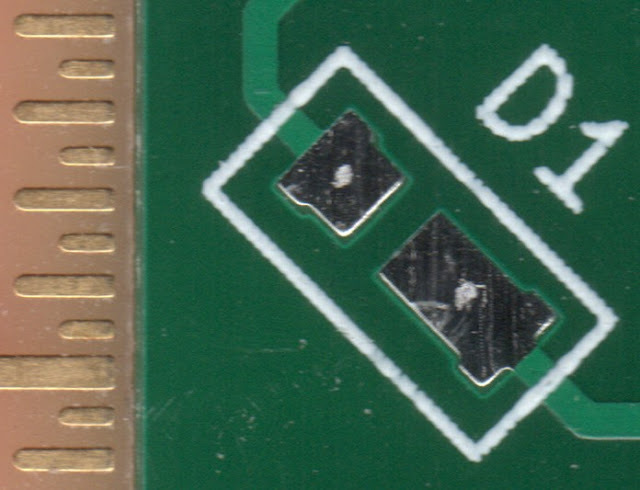 The board house does add a serial number, (seen in the footprint for the terminal connector in the image below) but that's standard. The silkscreen is high quality and very sharp, whereas the silkscreen on some other boards I've seen for other manufacturers look pixelated and blocky. The image below shows the registration between layers. The drill holes seem to line up well with the copper layer, but there is a small offset in the solder mask. That's nothing to worry about and is completely within specification. That's why you have solder mask expansion after all. 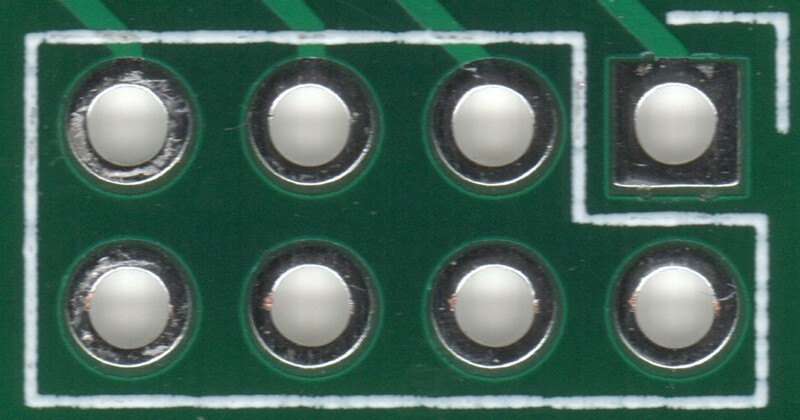 It's hard to see in the image below but the footprint of the LED I'm using has pads that are slightly T-shaped. The right angles in the corners are slightly tapered, but that's to be expected. The ordering process is easy too. I had a slight problem with the files names I used, but that was quickly resolved. The site also generates a nice render of the uploaded gerber files as a final verification step to make sure that all the layers are correctly identified. I intended to make my project open source and share it on the site, but I think I needed to include a license in the zip file I uploaded and I didn't realise this until I was part way through the order process. I'll look into that for next time. UPDATE: Matt from Breadboard Killer let me know that you can make designs open source after submitting the project by going into your account and editing the project. So I've gone ahead and done that. 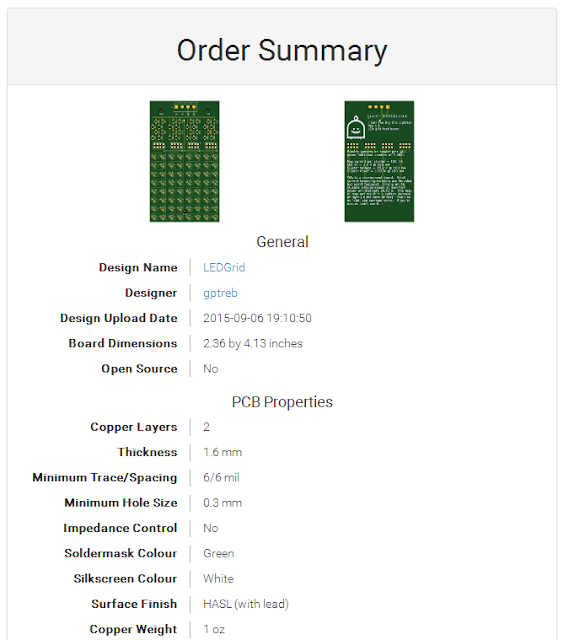 Here is my project page https://breadboardkiller.com.au/designs/55-ledgrid. The order took 19 days to arrive. I picked the cheap slower option that has a range of 8 to 20 days, so everything is OK there. The price is pretty reasonable as well. It's hard to compare this to services like OSH Park as they have different capabilities and multiples of boards. I'll have a go though. To be fair the OSH park boards have an ENIG coating on the pads, but most of the other specs are the same. OSH park could also look expensive due to recent changes in the Australian dollar. Not sure, but I think the breadboard killer PCBs are made in Singapore. This is based on the Singapore Post shipping option.